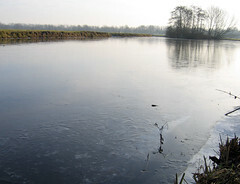 You’re standing together with your partner on the shores of a river covered by thin ice. “I bet life is much better on the other side,” he says. You don’t really think it’s looking much better than the side you’re on, but more importantly you’re pretty sure the ice is too thin. “Nonsense, the ice is fine,” insists your partner. “I don’t want to do this,” you exclaim. What do you do? Do you do everything you can to prevent him from attempting to cross the river, and if you can’t, will you stay where you are? Or will you follow him out onto the ice with the intention of going back if the ice starts breaking up? Or will you stick with him through thick and thin? This is what Scotland’s choices after the Brexit vote look like to me. We can try to convince the Westminster government that leaving the Internal Market is barking mad and a Norwegian solution is the only safe way to do a Brexit. And if they do opt for a hard Brexit in order to restrict immigration, we’ll hold a second independence referendum. However, some people seem to think it would be better to bide our time and wait to see what Brexit will be like before holding a second independence referendum. To me, that’s the equivalent of walking out onto the ice with your partner in the hope that you can get back to safety later if it doesn’t work. And of course the Unionists just want to stay with England, no matter what they do and what the consequences are for Scotland.